The House and Kennel Boarding and Grooming Shop of Silvercastle! Our Miniature Schnauzers live in our house as members of the family. They are our "children" and enjoy the comforts! When not relaxing or playing in the house, our Miniature Schnauzers enjoy the outdoors in their enclosed areas. Schnauzers love to run and play (chase squirrels or watch for birds!) or relax in the sunshine on a nice day. Our detached Kennel Building offers multi breed indoor and outdoor boarding facilities and our grooming shop and show preparation area. We offer grooming services for small and medium sized non-shedding dogs. Exquisite puppies for the discriminating enthusiast. 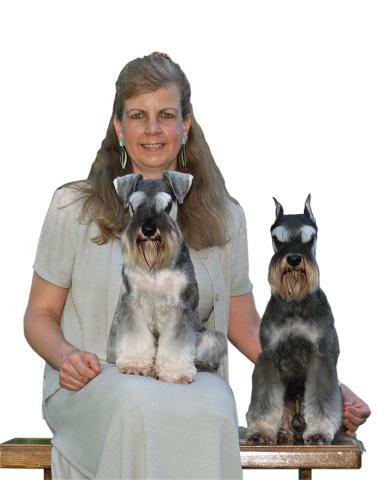 Miniature Schnauzers are our only breed. We have Salt & Pepper and Black & Silver purebred Miniature Schnauzers.. All our puppies are registered with the Canadian Kennel Club (CKC). We offer both show puppies and family pets to approved homes. The Land of Silvercastle is located in a rural setting on a small acreage with a dog boarding facility. We are in southwestern Ontario just north of the shoreline of Lake Erie due south of Simcoe and Tillsonburg. Our location is just minutes to the beaches of Port Dover, Turkey Point, Port Rowan and Long Point. Beautiful parks, conservation areas and wineries surround. From whatever direction you might be travelling from, it is a beautiful drive and out of the congested heavy traffic areas. We offer grooming and boarding services and seasonal obedience training. We welcome visitors by appointment. Miniature Schnauzers are a robust breed. They love to be with their humans and are excellent travellers. Small enough to take along but large enough to not be underfoot ranging from 12" to 14" at the shoulder and 15 lbs. to 18 lbs. in weight. Miniature Schnauzers possess a big dog attitude! The breed very much wants to be a member of the family. They are happiest when they are involved in activities and outings. Miniature Schnauzers are very alert and interested in any wildlife. The breed should be kept safely in a secure fenced in area or walked on a leash or extendable lead. While they are a non-shedding breed and great for allergy sufferers or the fussy homemaker, they do require hand stripping or professional grooming at least 4 times a year. Miniature Schnauzers most enjoy members of their human family 6 years and older.